This is one of my classic invented dishes. I haven't made it in quite a while, but probably made it for the first time at least 4 years ago. I always make it slightly differently, which is why it seems weird to try to document it. Bottom line is it's an awesome dish, one of my awesomest. So it's worth your while that I try. Most people have had classic shrimp scampi, not more than butter, shrimp, garlic, salt, pepper and pasta. Well, I drop the shrimp and add tomatoes and I get a fabulously flavorful vegetarian scampi. Same great scampi flavor, but meat free. When I made it this weekend, I got a big pan and heated a large glug of extra virgin olive oil and a tablespoon or two of Smart Balance (to replace the butter) over medium heat on the stove top. In the meantime, I smashed and diced 5 or 6 cloves of garlic. When the SB was melted I added the garlic and a little salt. I let the garlic cook for about a minute, not wanting to burn it. At that point, I added to the pan 2 pints of grape tomatoes. You could use anywhere from 1 to 2 pints at your discretion based on how tomatoey you want your final product to be. I have run the spectrum and they all turn out good but slightly different, so the tomato decision is big. Also, they have to have to have to be grape tomatoes and they cannot cannot cannot be chopped or halved ahead of time. They must be the whole grape tomatoes. Once I had my tomatoes in the pan, I made sure there were just enough so that they were in a single layer. I tossed the tomatoes around in the garlic and oil to get a nice coating and added a little more salt and now a little pepper. I then let them cook for a couple minutes while I got my pasta cooking. After about 3-4 minutes, I got a spatula and pushed the back of it against one of the tomatoes. It popped, releasing its juices. If it didn't pop, I would have left the tomatoes on for another minute and tried again. Once one popped, then I popped all the rest with the spatula. I made sure to get them all. Once they were all popped, I used the spatula again to continue pushing on the layer of tomato shells to push out all the juices. I then turned the heat up to high and started stirring the mixture well fairly consistently. I didn't want any to stick to the pan as the liquid burned off. I kept stirring until the sauce had reduced in volume by about half and had thickened up. This meant the water from the tomatoes had mostly cooked out. I then added a half a cup of red wine to the pan to deglaze it. I scraped the bottom, so that all the bits got worked back into the sauce. After mixing, I let the sauce cook down again. The original tomato and scampi flavors were concentrated the first time the sauce reduced, and the flavor of the wine with the tomato concentrated during the second reduction. It made for a bold, powerful and complex flavor for the sauce that started as untouched tomatoes. At this point I wanted my pasta to be about two thirds cooked. I drained the pasta, turned down the pan heat to medium and put all the pasta immediately in the pan with the sauce to start gently incorporating the sauce into the pasta. 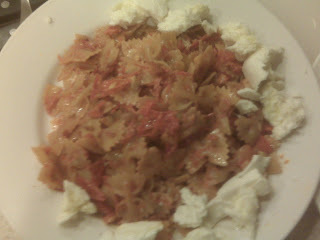 Then I put about a quarter cup of shaved fresh mozzarella into the pasta and mixed it in vigorously so that it would melt into the sauce and pasta, almost unnoticeably. I plated the pasta and then put a few more little hunks of the fresh mozzarella along the side of the pasta to add a little more coolness and creaminess to balance out the strength of the sauce. It is such a delight to eat this scampi dish. Julia absolutely loved it and was amazed by the complexity of its simplicity. I think for me I love it more for the simplicity of its complexity. But either way, it is an exquisite dish to make, and I know that it will be one of my classics for quite a while.